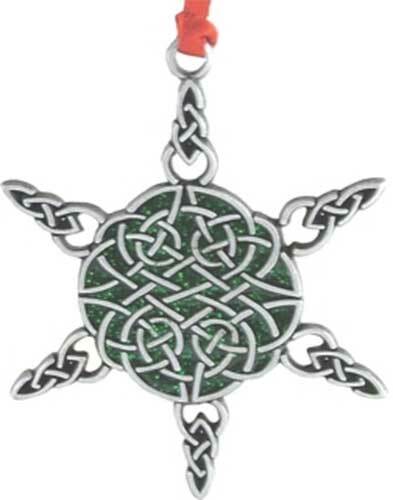 Irish Christmas ornament features a pewter snowflake with intertwined Celtic knot-work. Every snowflake is unique and one of a kind...May this ornament be a reminder that you, too, are a special find! This pewter Irish Christmas ornament features a Celtic snowflake that is enhanced with knot-work along with green epoxy accenting. The Celtic snowflake Christmas ornament measures 2 3/8" wide x 2 3/8" tall and it includes a red ribbon for hanging on your tree. 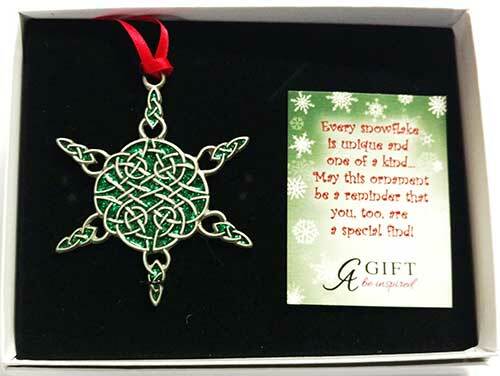 The Irish snowflake ornament is gift boxed with a blessing card along with a Celtic knot history card, complements of The Irish Gift House.